Suggested levels for this lesson are junior and high school grades. 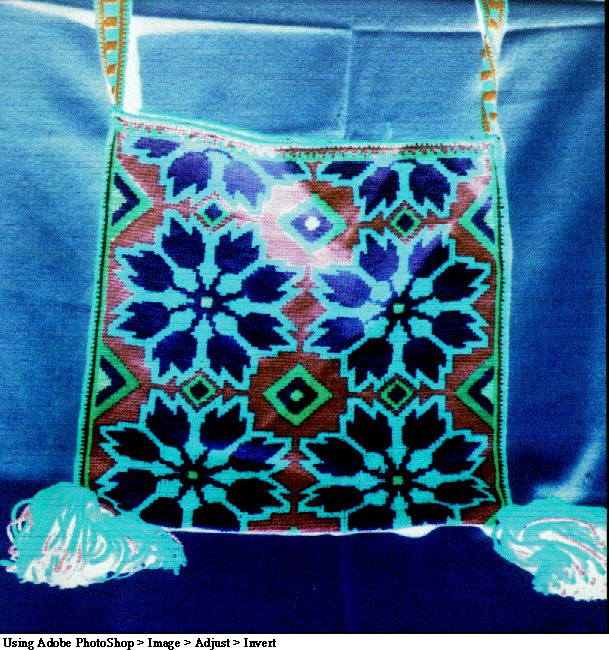 In this lesson, students are introduced to Huichol embroidery and weavings. 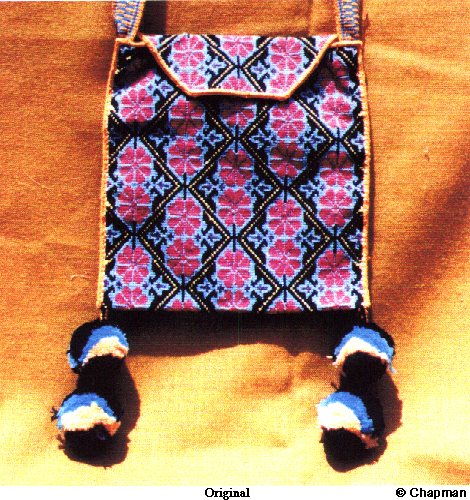 Much of a Huichol's woven clothing, purses, pouches, and jewelry are worn every day, by Huichol men, women, and children. 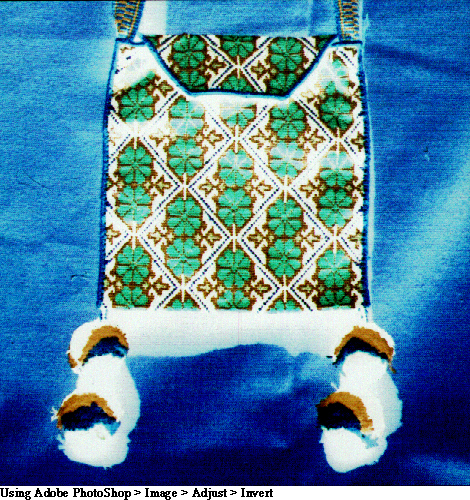 These outfits are also worn on special days found within their agricultural calendar. 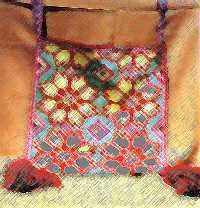 Pouches, purses, and shawls (mantas) are used by both men and women. The images and patterns are inspired by dreams and the natural world. Many of these images and colors are symbols that both adorn and metaphorically protect the wearer. ...women, men, and children are all artists in Huichol culture. There is no specific word for art in this culture as in many indigenous communities. ...children are taught embroidery/weaving at a young age, and continue this art into adulthood. 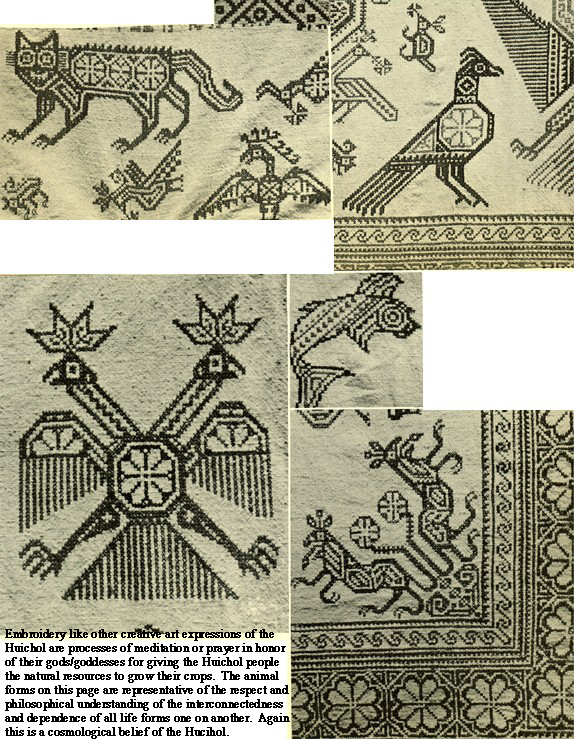 Embroidery created by adults is thus highly complex in fractal patterning--that is using an image over and over, sometimes with minute changes in color and the pattern itself. ...the Huichol imagery used in embroideries/weavings may be derived from dreams, symbols, and experiences in nature. The imagery includes flowers from their special cactus--peyote, animals, lines and shapes that define the space around the repeated image. 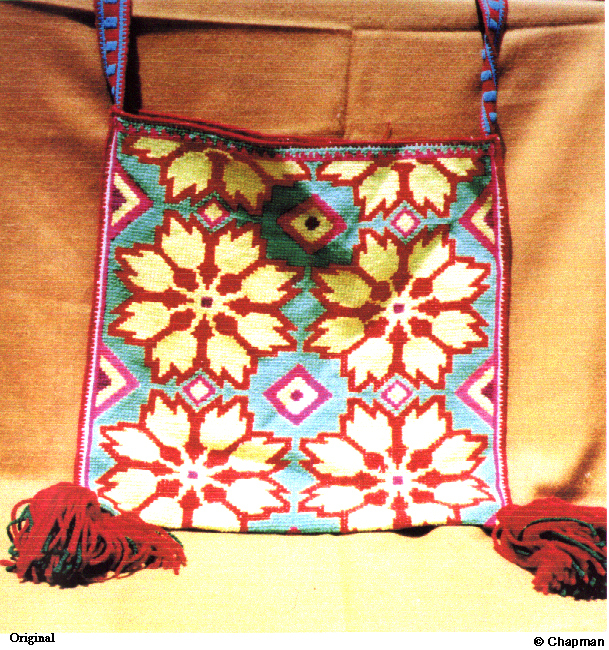 Study the included examples of woven Huichol bags. 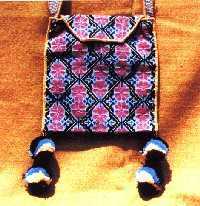 ...the Huicholes use their symbolic embroidery/weaving to both decorate and protect the wearer. 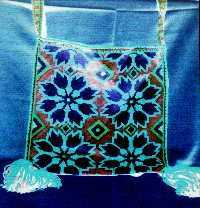 Embroidery is defined as ornamenting cloth with designs in colored thread using a needle. 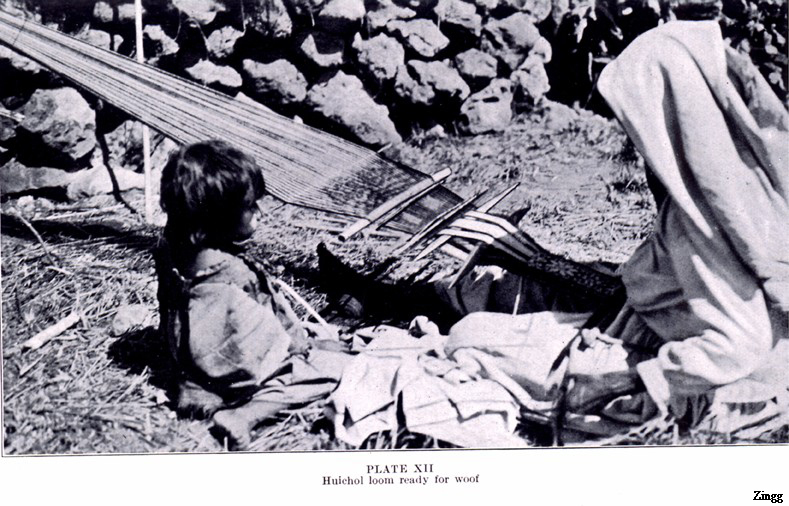 Weaving requires the use of a loom. 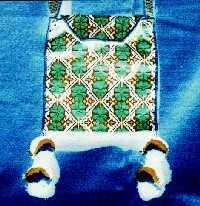 ...embroidery is used in special outfits for children, women, and men. 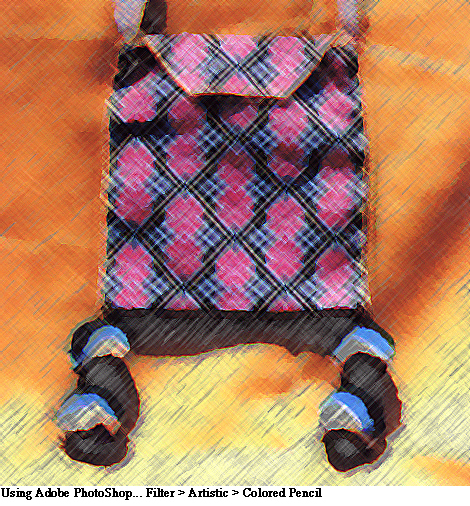 Weaving is used in purses, pouches (portable pockets), and sashes. These are used during special occasions, but are also a part of daily dressing. ...how to create a pattern by using an image or shape over and over again. Repeat pattern. ...to look to the natural world for inspiration in their selection of image for their art. ...how to use the complements of colors used in their drawings to create different effects in their art. ...primary colors are those from which all other colors are derived. These are red, yellow, and blue. ...that by combining the primary colors, the secondary colors are derived. These are purple, orange, and green. By using complementary colors, students learn to create very strong combinations and patterns. Complementary colors are: red/green, yellow/purple, and blue/orange. 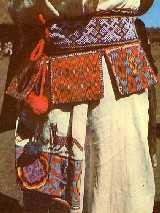 ...children (male/female) in Huichol society are taught embroidery/weaving, and continue this art form into their adulthood. 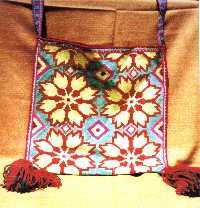 By practicing this art throughout their lives, Huicholes are very adept at patterning in their embroideries/weavings. Use the examples in this unit. 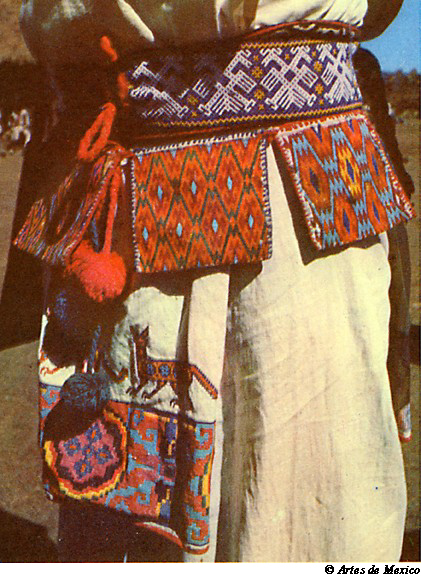 ...Huichol embroidery/weaving is very strong in the use of colors. 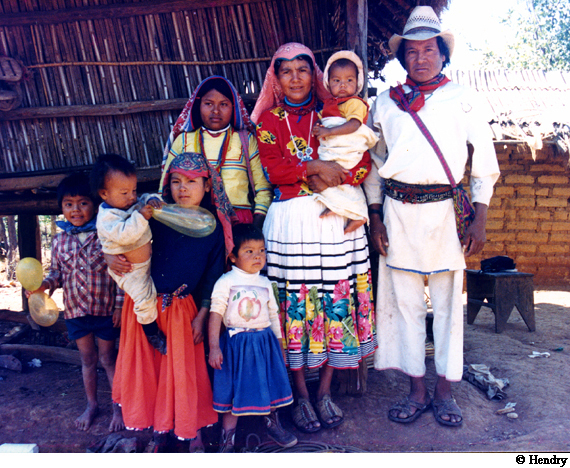 Huicholes use their embroideries/weavings to decorate a variety of clothes for all men, women, and children. 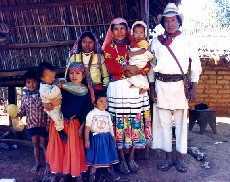 Huicholes use certain clothing on special days, yet they wear this traditional clothing at all times in their ranchos. 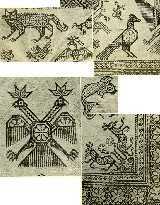 ...the colors and imagery used in their embroideries may also provide symbolic protection to the wearer. 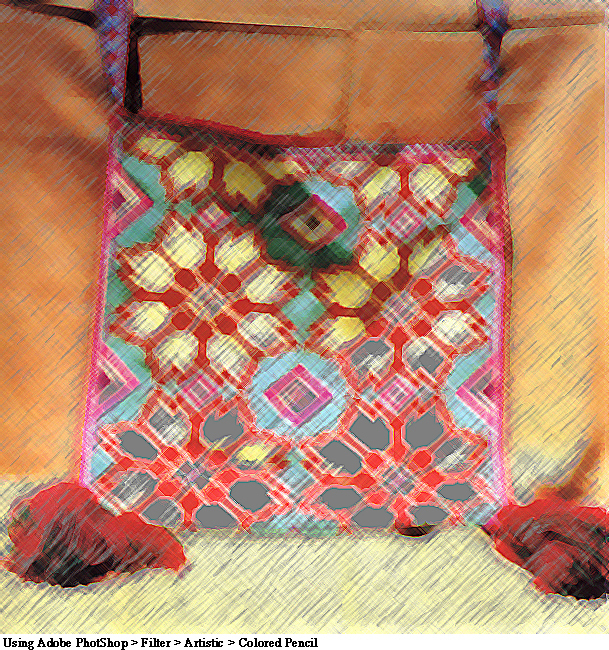 Images for the Huichol designs are found in dreams and in the natural world. These symbols have special meanings for the wearer. Have the students choose an image or pattern found in the natural world that has special meaning to them. Ask them to share some of their ideas out loud. After they choose the image, have the students create a pattern by drawing the image over and over again on a piece of paper. Ask the students to color the images, using the same colors in each section of the pattern. Fill in the background between the images with another color. Note attached examples. Next scan these drawings on the computer scanner, and use a computer program (paint program or photo shop) to invert the colors originally used. Again discuss the complements of each color. You may want to use a color wheel to explain primary and secondary colors. By using complimentary colors, students learn to create very strong color combinations and patterns. For a comprehensive guide to the images and symbols used by the Huichol, the Lumholtz publication can be secured at the libraries of Northern Arizona University, Arizona State University, or University of Arizona. For those persons in other states, check your local library systems.